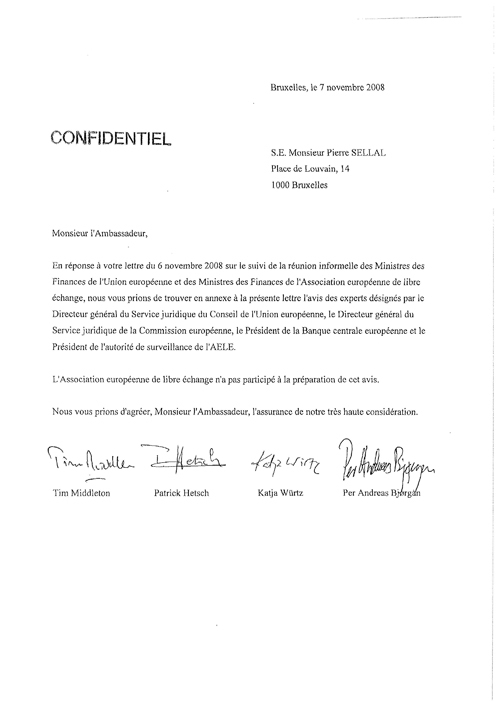 En reponse a votre lettre du 6 novembre 2008 sur le suivi de la reunion informelle des Ministres des Finances de l’Union europeenne et des Ministres des Finances de l’Association europeenne de libre echange, nous vous prions de trouver en annexe à la presente lettre l’avis des experts designes par le Directeur general du Service juridique du Conseil de l’Union europeenne, Ie Directeur general du Service juridique de la Commission europeenne, le President de la Banque centrale europeenne et Ie President de l’autorite de surveillance de l’AELE. L’Association europeenne de libre cchange n’a pas participe a la preparation de eet avis. Nous vous prions d’agreer, Monsieur j’Ambassadeur, J’assurance de notre tres haute consideration. This opinion is limited to addressing this specific question. It is given in the personal capacity of the nominees and does not commit their respective appointing authorities. The European Free Trade Association did not participate in the preparation of this opinion. 2. Directive 94119/EC of the European Parliament and of the Council on depositguarantee schemes I creates harmonised requirements in relation to guarantees of deposits in credit institutions. By Decision of the European Economic Area Joint Committee No 18/94 amending Annex IX (Financial Services) to the EEA Agreement2, the Directive was incorporated into the Agreement on the European Economic Area. The effect of such incorporation is that, by virtue of the EEA Agreement, the EEA EFT A States are bound by the rules of the Directive. 3. The Directive sets an obligation to pay depositors at least 20.000 EUR when deposits become unavailable, i.e. when the relevant national authority has determined that the credit institution concerned is unable to repay the deposits. The Directive does not preclude provisions which offer a higher or more comprehensive cover for deposits, provided that this cover is applied to aggregate deposits, irrespective of the location within the EEA. make an exception for times of financial distress. 6. Consequently, Iceland has to make sure that its deposit-guarantee scheme has adequate means and is in a position to indemnify depositors. 7. The Icelandic Financial Supervisor declared in early October 2008 that the Landsbankj, Kaupthing and Glitnir banks were unable to repay certain deposits. The scheme must be in a position to pay duly verified claims within three months, subject to any extension of time that may be granted. If Iceland’s deposit-guarantee scheme is not in such a position, Iceland is in breach of its obligations under the Directive. 8. Article 3 of the EEA Agreement provides that “The Contracting Parties shall take all appropriate measures, whether general or particular, to ensure fulfilment of the obligations arising under this Agreement. They shall abstain from any measure which could jeopardize the attainment of the objectives of this Agreement. Moreover they shallfaci/itate cooperation within the ji-amework of this Agreement”. 9. It is for the EFTA Surveillance Authority to assess the compatibility of the Icelandic legislation with the EEA Agreement, on the basis of a complete set of facts and to consider whether to take action in relation to possible breaches of the EEA Agreement. The Agreement also provides for cooperation between the EFT A Surveillance Authority and the Commission. 10. In response to the specific question as regards Icelandic banks, Iceland has to ensure that the depositors are treated in compliance with the EEA Agreement, including the Deposit-Guarantee Directive, which requires that deposits are repaid up to at least 20.000 EUR for each depositor when deposits become unavailable, regardless of whether their deposits are held in Iceland or at a branch of an Icelandic bank in another EEA State. Iceland should take all appropriate measures to ensure respect of the provisions of the EEA Agreement.